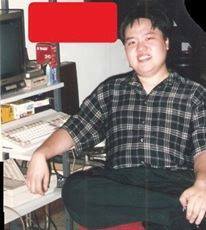 We at Amitopia wants to deliver quality articles and here I go on with a yet another one, where I have interviewed Gilbert Tan, which is a huge Amiga user in Philippines, Asia. How many Amiga users there are left on Philippines we don’t know, but here is one that is really passionated about Amiga. Read on for our exclusive interview with a very active Amiga user on Philippines. 1) Can you introduce yourself? What do you do on Philippines? … My name is Gilbert Tan, and I am 45 years old. Married and also got a boy which is 10 years old. Today, I am a self-employed apprentice code and games/app designer. 2) How did you get to know Amiga? Who introduced you to the platform etc? It was 1981, when I got interested in Computers. I had no idea, that the first picture of the computer that I saw in an ads was a Commodore 64. My dad bought it years later in 1987. Later I got myself an C64c with 1541 floppy drive and a Centronics star printer. I used it for school and I did use GEOS 1.3 on it. Yes, I used my C64c during grade school until high school. 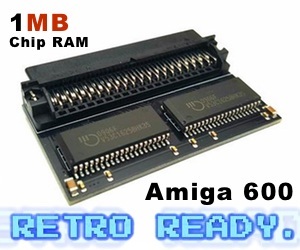 And when did the jump to Amiga happen? Why didn’t you move onto PCs? Good question! Soon as I got to College and took Computer Science Degree, where I didnt need to use a PC at the time. So in 1991, I managed to sell my C64c and move up to my First Amiga computer, which was an Amiga 500. For 4 years I used my Amiga to “show-off” how the Amiga can compete against i386 PCs back then. So, I made simple games and demos on the Amiga. 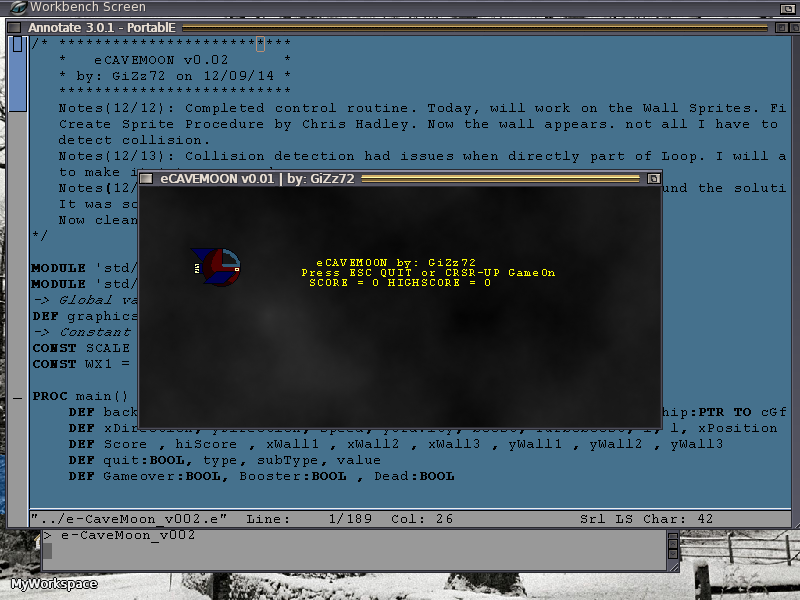 I thank AMOS Pro programming package for Amiga, for making all possible for me!! On my final year in the college, I propose to create a fighting game based on the Street Fighter 2, back in 1997. I called the project “Lemming Fighters”. Here Gilbert Tan is Compiling for 68K, but it is emulated, since he doesn’t have 255MB of Fast Ram on his Amiga 1200. 3) How did the Philippines Amiga marked go? Did you have Amiga stores or communities? There was only a few Amiga stores for the Amiga here in the Philippines. The usage were mostly targeted top video production, using Amiga 2000 and the Video Toaster. A500 was also used for video titling, using a GenLock. It was a real golden age of the Amiga, before April in 1992. So, are there still companies and stores using Amigas in Philippines? Only one was left standing, after the crisis at Commodore. However, they also shifted to PC a few years later. Slowly after the American Base left at Subic in 1990 which is where all the c64 and Amiga wares came from there were nowhere to get software for them.. Yes, there was one, but it was removed due to some political squabbles and such. I was so young at that time. So, how do you get Amiga software and hardware today? The only place left to get software in Philippines is on the Aminet today. When the internet was introduced in 1992, using a modem then Aminet became accessible for Amiga users here. 4) You said you started to do code on Amiga. What else kept your Amiga interest, after 1992 until now? With the pc hardware got improved, I had no choice but to use a PC (Dell 220) in 2010. Which introduced me to AROS -Icaros Desktop. 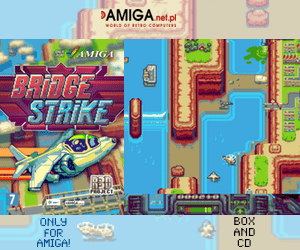 So I stick through Amiga like glue from 1992 ~ 2010. I still code using AMOS Pro. Thats something that Ive been doing after graduation in 2000 until 2013. I managed to keep my Amiga 1200 alive. I did some expanding of it. Remember that the last store, that shifted to PC, I went back and talk to the owner who became a great friend and told me to haul as much Amiga Hardware I can carry! So that happed around 2012. In a small time of period, I had an Amiga 600, 2x Amiga 2000, 1 Amiga 3000 and one Amiga 4000. Later around 2 years. I sold them to good friends. So the only Amiga left in my inventory today, is my Amiga 1200. Anyway, In 2014, I had health issues and forced to stop working. ..Health problems isnt fun for sure! You wrote.. Now “she” has ohh, you meant the Amiga? So, I was able to recover 3 years later. and for me to start over I tried to revive “her”(My Amiga) last Feb 8. Thus the Video I was able to recover her Hard disk. It was a great leap forward. with new IDE and programming languages for these Next Gen Amigas, cross-compiling is the key to create new games for next generation! Some examples would be FreePascal, and PortablE(Amiga E). A great opportunity for aspiring devs like myself would continue the legacy! 5) Do you have AmigaOS4, MorphOS or AROS machine today? 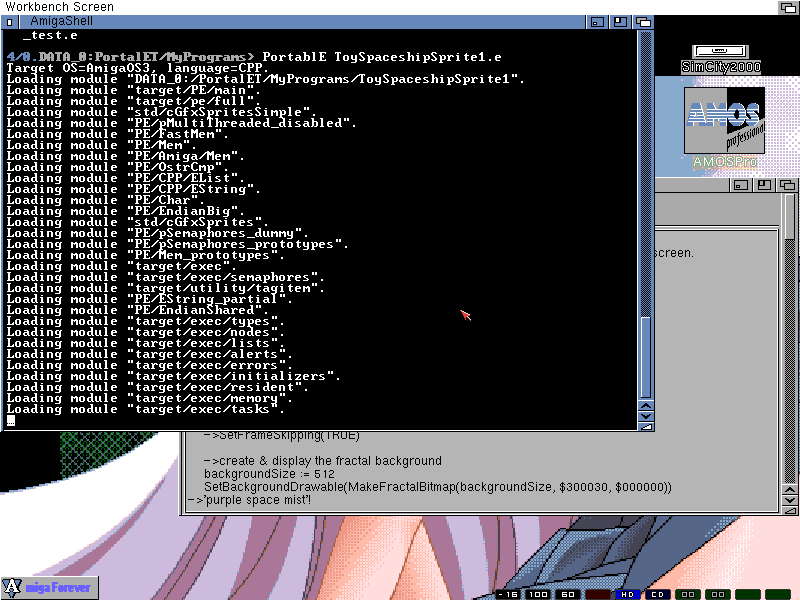 Unfortunately, I dont have AmigaOS4 or MorphOS machine. Only a PC which got AROS – Icaros Desktop installed. Macs Hardware and AmigaOS4 Hardware is too expensive for me.The next best thing is AROS for me right now. 6) What do you develope on Amiga? You talked a lot about AMOS Pro usage. What other programming tools do you use? I also figuring out PortablE for AROS. It was formerly AMIGAE. It would be and honor for me to help more Amigans alike. 7) What do you think that A-EON should do to make Amiga more popular in your part of Asia? Of all the people in this part of the world, that hardly knew what Amiga was/is. In order for A-EON to be competitive, I would encourage cross compiling to multiple platforms. Actually That is my goal. 8 ) What programs have you made? 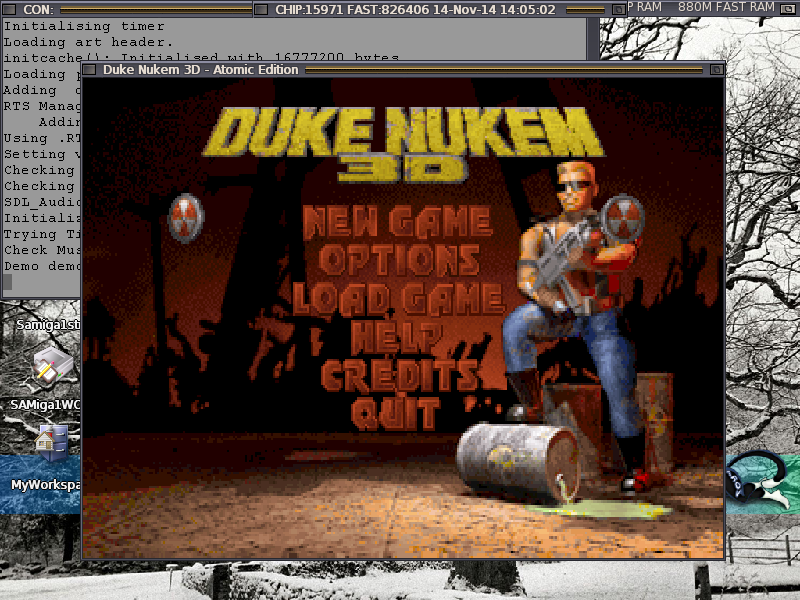 For the Amiga, I had unfinished projects that still needs to be completed. So far one of them is Lemming Fighter. Gryus is however a game that I managed to complete. On the AROS side, WIP is a RPG/TEXT adventure style game. I will finish it hopefully this year, if time and money permits.. It was really nice to be able to interview Gilbert Tan from Philippines. I really wish him all the best in the future and may the health be good for him. Now I hope that A-EON or others in the Amiga community reads this and see that there are Amiga users in Asia also. Most of the Amiga products are very expensive, especially for people outside of Europe and USA. The Amiga status is still pretty much underground worldwide, but that shouldnt prevent some to not get the hardware. It is however nice to see that AROS which is open source AmigaOS, can actually do something about this. With more interviews and more serious articles like these, I hope that Amitopia can become a site with more interesting interviews like this one. 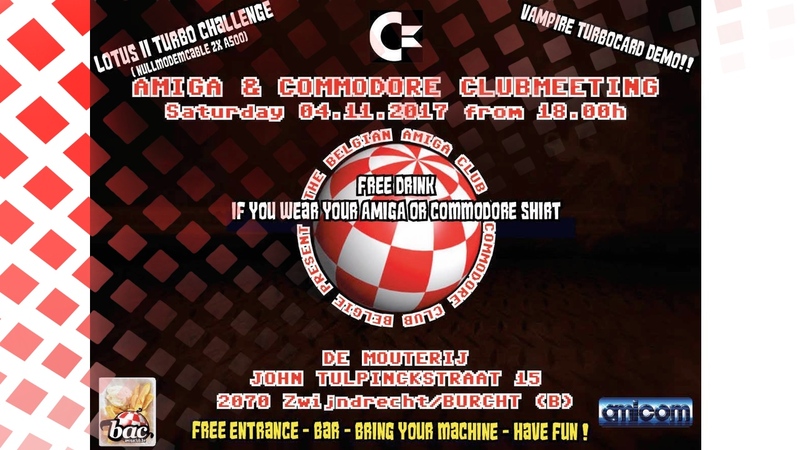 Support Amitopia, by clicking on our banners, share our articles and spread info about that Amiga is very much alive everywhere.